To be held at the Roma Administration Centre on 13 August 2014. Local Government Regulation 2012 Section 275(c) the local government budget. 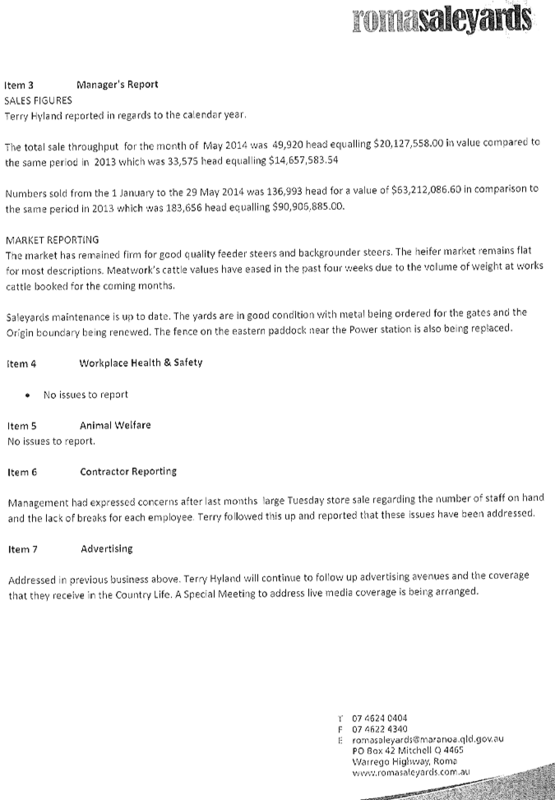 Local Government Regulation 2012 Section 275(a) the appointment, dismissal or discipline of employees. That Council approve the new service agreement for the Supported Accommodation Assistance Program (SAAP), unti1 March 2015. That Council become a member of the savewater!® Alliance. 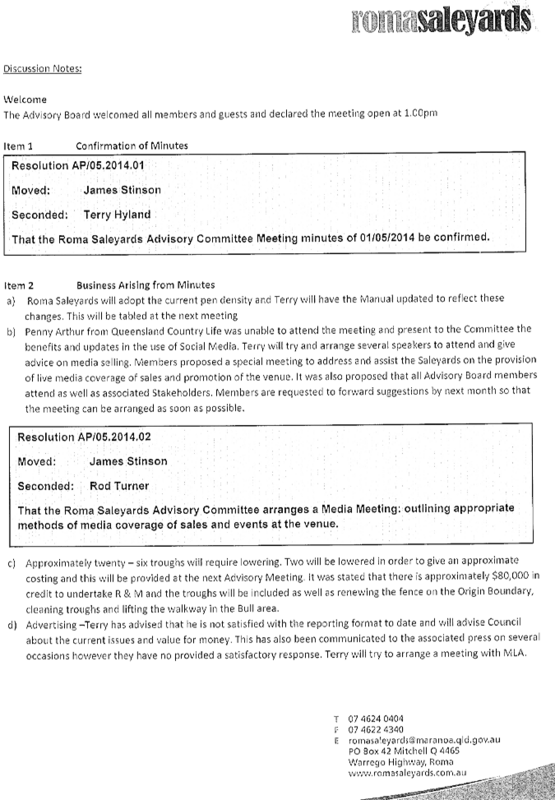 This report provides a copy of the confirmed meeting minutes of the advisory committees that held meeting during the months of May 2014 – June 2014. 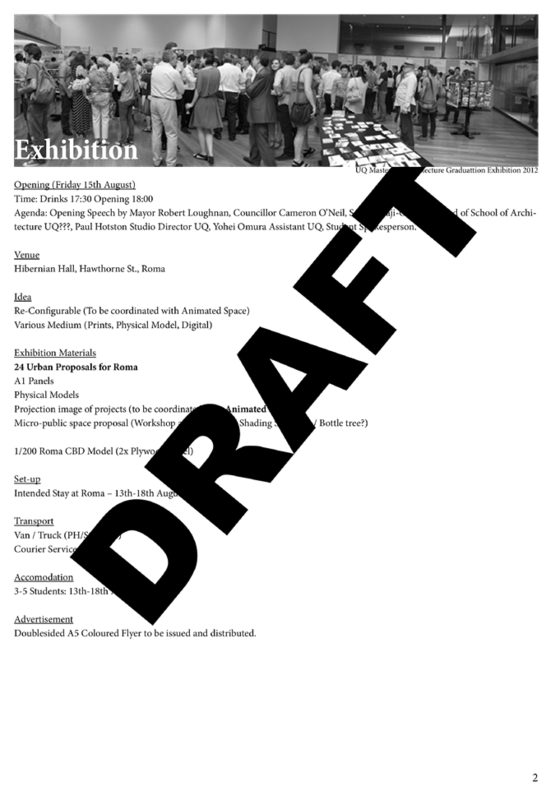 UQ School of Architecture have put forward a draft proposal for Council’s consideration. The proposal includes an exhibition and workshop component, both inviting attendance and participation from the local community. The town of Roma has been nominated for a focus study as part of the students assessment and research program. The program includes development of proposals for urban propositions and architectural interventions which respond to the towns’ current presentation and anticipate possible future visions. That Council endorse the proposal and approve the provision of financial support as presented. 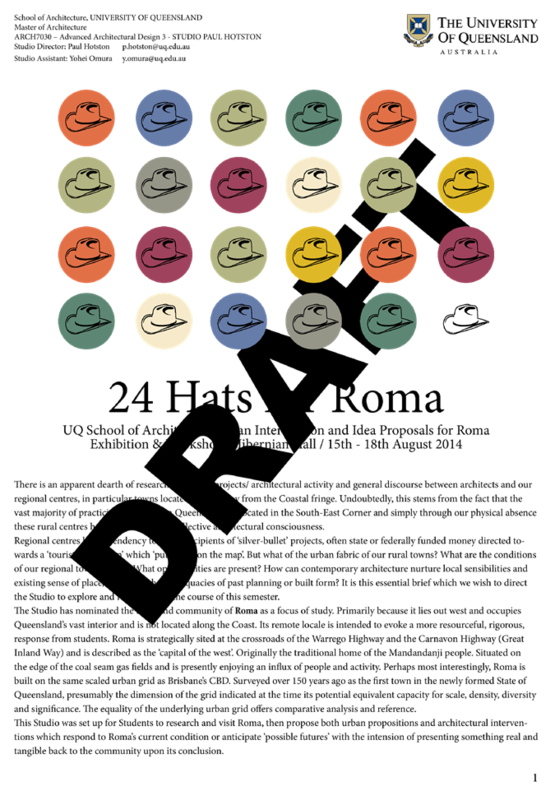 Representatives from the UQ School of Architecture have previously conducted an initial research tour to Roma, liaised with Cr. O’Neil in his capacity as Portfolio Chair for Town Roads, Streets, Footpaths and Parks & Gardens, and most recently presented to Council at the Workshop on 2 July 2014. 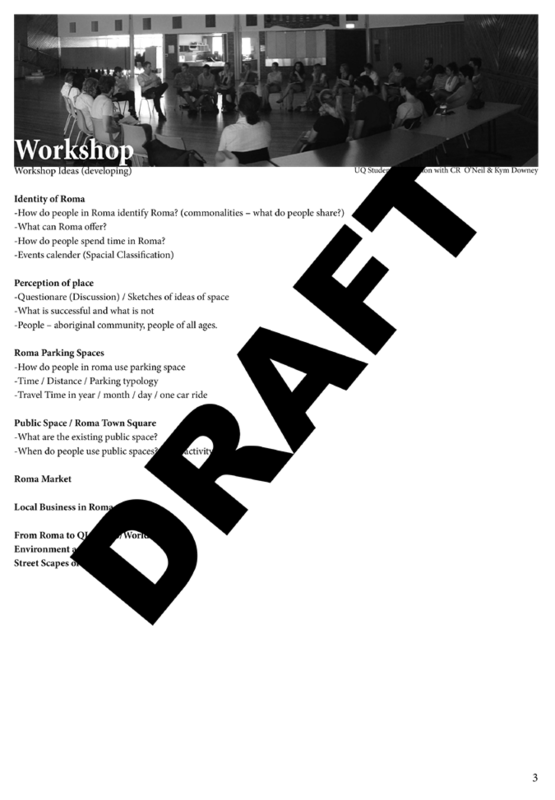 At the workshop, Council requested a formal proposal be submitted by the UQ School of Architecture, outlining the proposed program, and their request with respect to ‘In-kind’ and financial assistance requested of Council for formal consideration. · Two workshops be held on Monday 18 August – inviting comment from the public and business community in response to the potential ideas put forward, and seeking views on the elements that are important to locals in consideration of developing a future ‘town-scape’ vision for Roma. 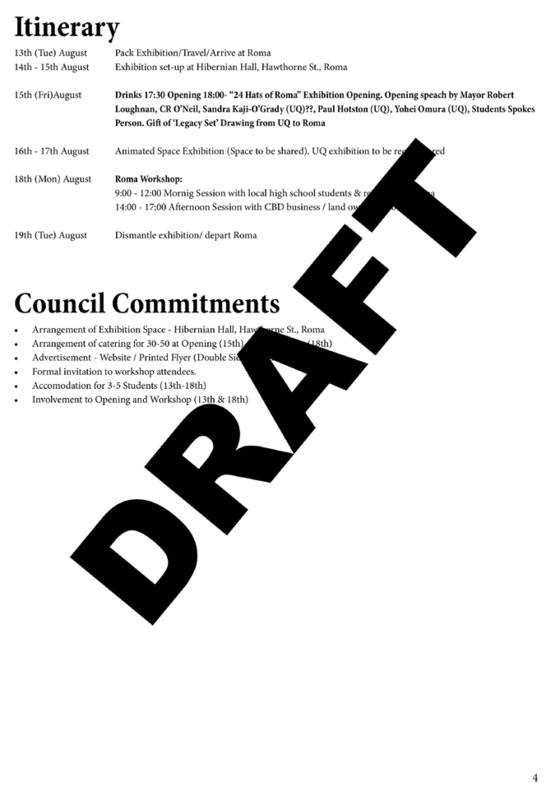 A copy of the draft proposal is attached for Council’s review. The finalised study documentation can be considered as part of planning for Council’s Roma CBD re-development project. 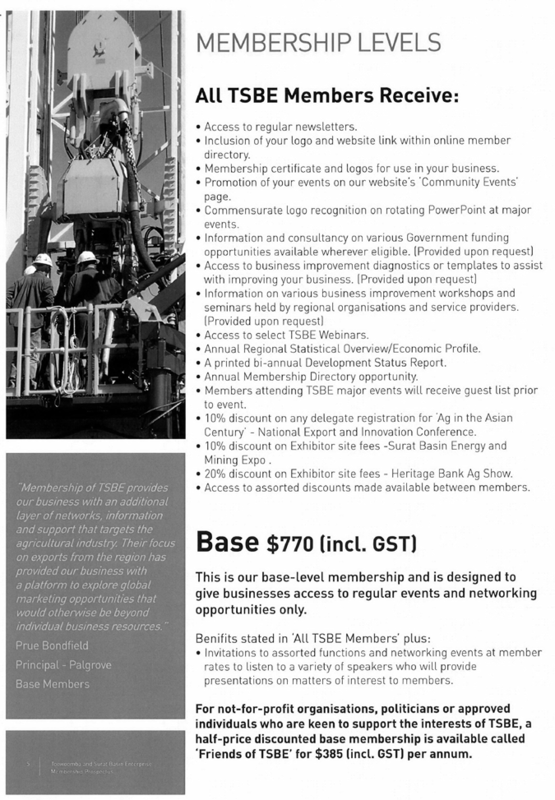 Estimated cost of $1,725 can be accommodated for under Elected Member & Community Engagement Events budget allocation 2014/15. Due to personal work commitments, Cr. Peter Flynn has requested a brief leave of absence from Council duties extending from 22 - 30 July 2014. That Cr. Peter Flynn’s request for leave of absence from Council duties be granted for the requested period. On 15 July 2014, Cr. 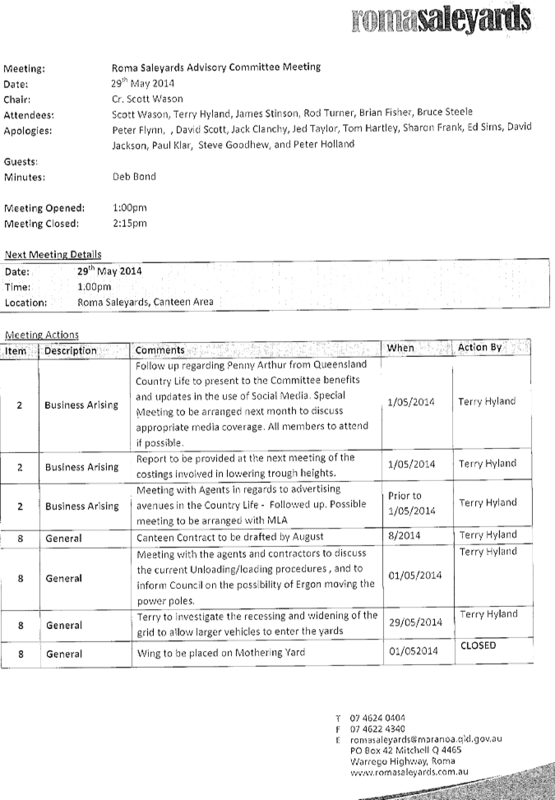 Peter Flynn forwarded a request to the Chief Executive Officer and Mayor, requesting exemption from Council duties for a brief period, extending from 22 – 30 July 2014. This would mean Cr. Flynn is unable to attend the upcoming Council meetings scheduled for 22, 23 and 30 July. The request has been put forward due to a period of increased work commitments over the coming weeks. Council’s approval of this request is now sought. Cr. Flynn would not be present to vote on matters presented at the upcoming specified meetings, however, in his absence Council has enough remaining Councillors to meet quorum requirements specified under the Local Government Regulation 2012. Subject Heading: Endorsement of Contracts and Memorandum of Understanding with external partners to enhance service provision within community care. Council have previously endorsed that Memorandums of Understand and contracts from external providers be signed by the Chief Executive Officer to enhance existing service delivery. Council has a legislative obligation to continue to meet the legislative requirements within the service agreements during the transition of services. Service delivery can be enhanced within communities to deliver flexible models of care when service providers pool resources to support communities. Examples of this include funding for staff to provide services to clients that another service provider may be contracted to deliver or the purchase of meals to provide as a service type for Home and Community Care. In order to deliver services, providers need to ensure that they have mitigated risk involved and are meeting the legislative requirements of their service agreements, especially if entering into a brokerage or subcontract arrangement. Existing Memorandums of Understanding and contracts were reviewed by McInnes Wilson prior to the original documents being signed. In order to comply with the Community Care Home Care Standards and Human Services Quality Standards, a register and relevant information must be kept on site and a sub contractor register submitted to the Department of Social Services via the Aged Care Portal. Minimal due to advice through McInnes Wilson Lawyers. Representatives of Commerce Roma have verbally requested that a digital version of the Focus on Roma publication be included on the Council website and MyMaranoa App. Both Council’s website and the MyMaranoa App can accommodate this request without modification. That Council approve the request to publish an electronic version of the ‘Focus on Roma’ booklet on the Council website and MyMaranoa App. Commerce Roma has requested that the digital version of their publication – ‘Focus on Roma – be included within the Council website and MyMaranoa App. Currently, Commerce Roma has a section on Council’s corporate website (under the business tab) that provides a quick overview of the organisation, and a link to their website. The PDF version of the abovementioned publication could be located on this page in the interim, awaiting the development of the new website. The MyMaranoa App can accommodate small PDF documents on individual listings; however the feature is not currently publically available. Should Council approve Commerce Roma’s request, the feature will be released to the public. If numerous businesses/community organisations upload PDF documents it could potentially slow the operation rate of the App and result in higher data charges for users. 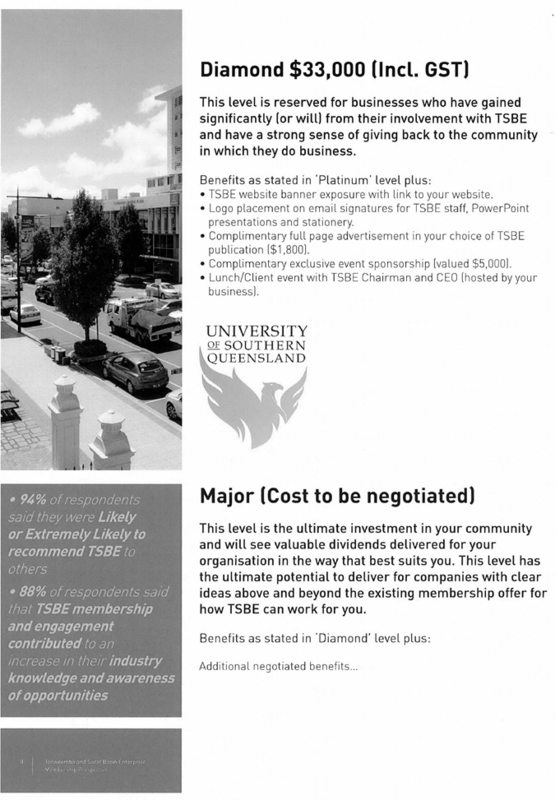 Since March 2012 Council has been a platinum sponsor of Toowoomba and Surat Basin Enterprise Ltd (TSBE). 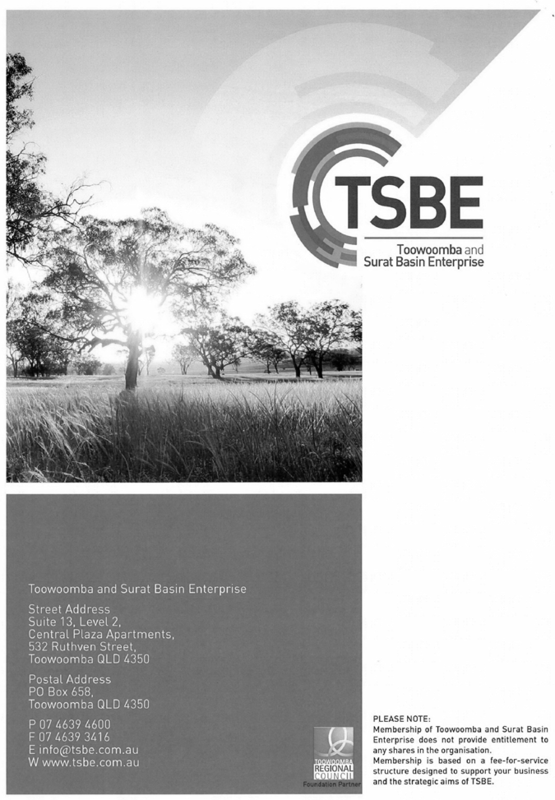 The achievements of TSBE are well documented in reports to Council and are also obvious in the local (Surat Basin) media. The Regional Economy enjoys useful benefits through inputs provided by TSBE staff and board members and it can be agreed that the benefits relative to the investment by MRC have been well justified. The anniversary of our Platinum subscription level has arrived and this report seeks Council’s endorsement of its remittance. That Council approves the renewal of the sponsorship of Toowoomba and Surat Basin Enterprise Ltd at the Platinum level as described in its renewal notice. 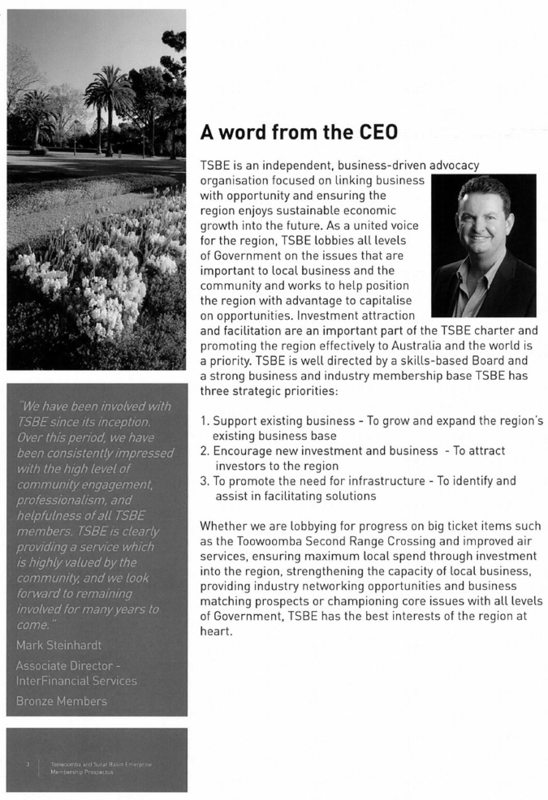 Formed as a merger between Toowoomba Region Enterprise Ltd and Surat Basin Corporation (SBC) in 2012, the TSBE is a private sector owned economic development corporation. It receives its major funding from Toowoomba Regional Council (TRC) and sponsorships from members like Maranoa Regional Council. 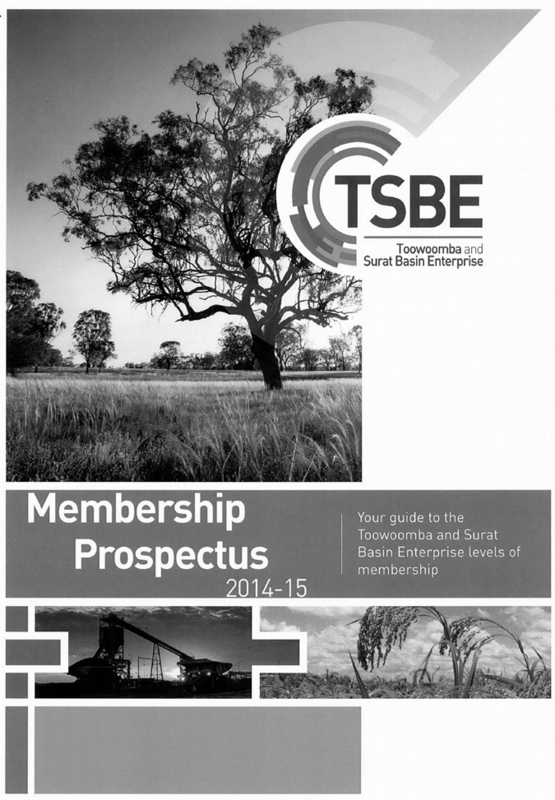 The objectives of TSBE are consistent with the Maranoa Economic Development Strategy and its implementation plan. Council has invested a sum total of $60,000.00 (excluding GST) over the past three years to date firstly in the former in SBC and then TSBE. 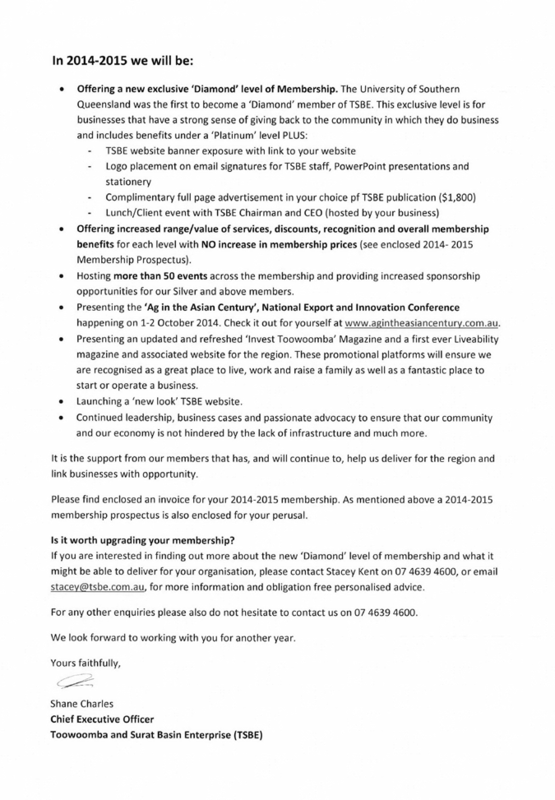 Through this sponsorship Council has demonstrated its endorsement of the work of this organization to advance the interests of the business community in the Maranoa and the wider Surat Basin. 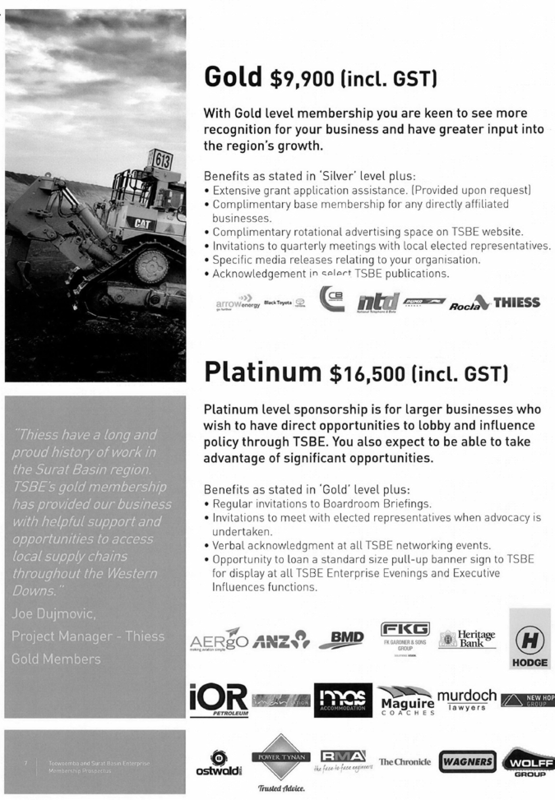 At a strategic level, the officers and directors of TSBE have made many visits to the Maranoa, to host networking functions and provide strategic advocacy for projects of mutual interest. This has been well received and appreciated by the local business community. 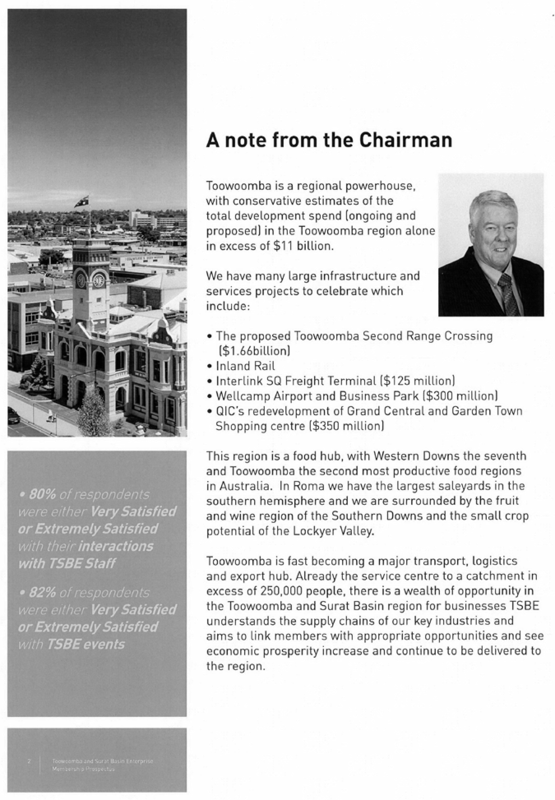 · Advocacy to Skytrans as an alternative RPT Airline -Toowoomba to Roma. 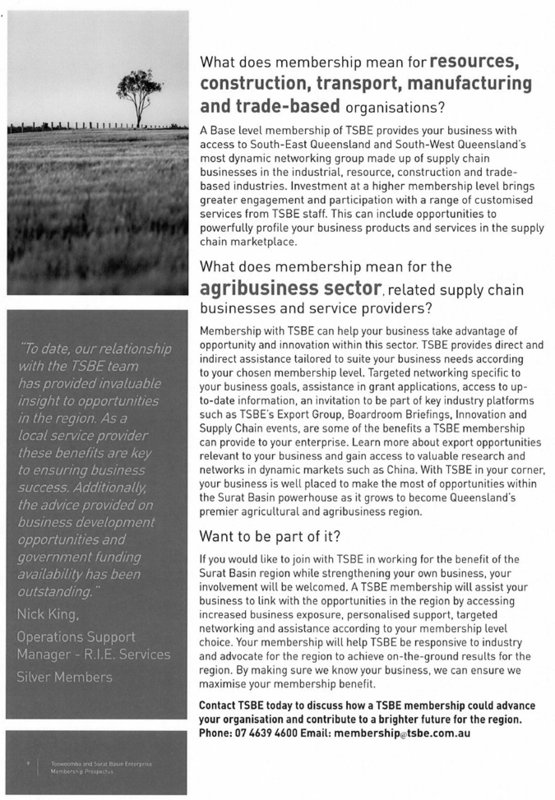 · Inclusion of TSBE as a partner with DSDIP in developing the CSG supply chain in the region. · Regional profiles e.g. 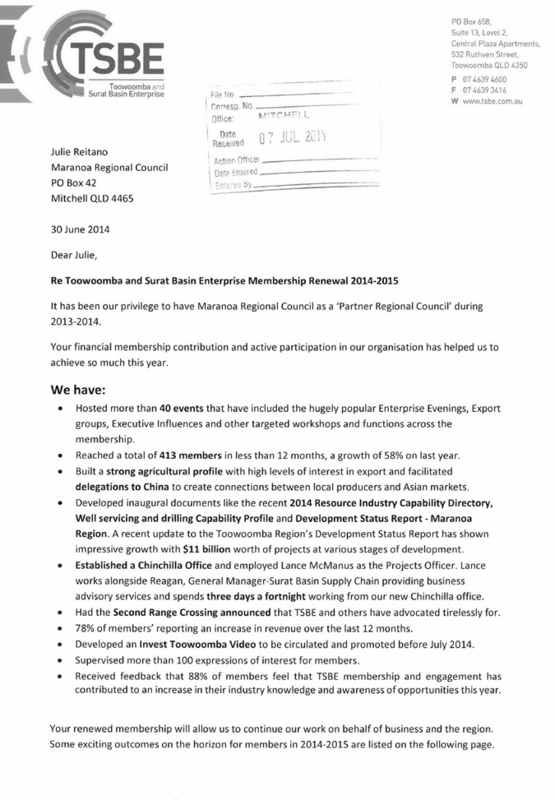 “Maranoa Development Status Report” as part of the Surat Basin Development Status Report. 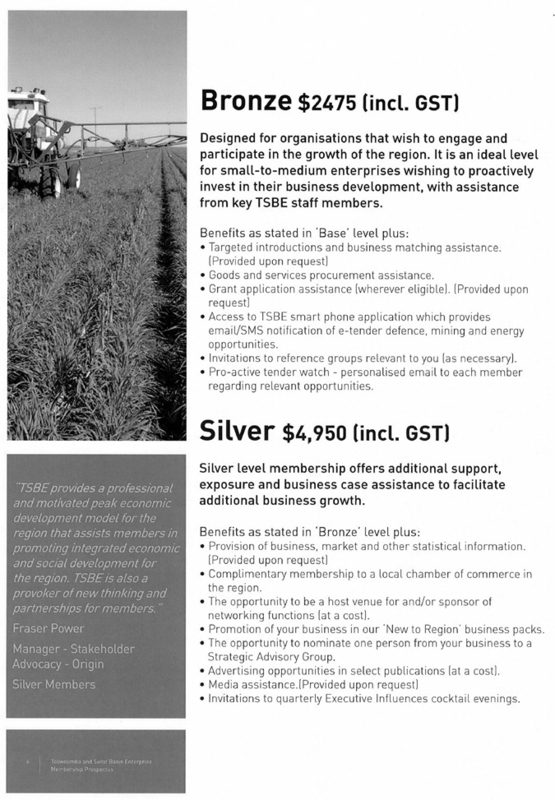 · Specialized assistance to the Ag Sector in the Maranoa. · Hosted a study visit to the USA and Canada. · Presenting the “Ag in the Asian Century” National Export and Innovation Conference in October 2014. The outlook for TSBE in the region for the next 12 months at least, is strong and they will contribute to achieving some of the key goals of our economic development unit during 2014-15. It is with this knowledge that I have no hesitation in recommended that Council resolves to continue to support TSBE for another year. Immediately prior to 30 June 2014, Department of National Parks, Recreation, Sport and Racing released funding called Get Out, Get Active to provide local governments with funding to support community-based approaches to the delivery of enjoyable, accessible and affordable activities which may be in partnership with local clubs, businesses and community organisations, to get women and girls physically active. The guidelines state the contribution to the eligible project costs, maximum being $20 000, for a Council population of greater than 5000 and up to 40 000 residents shall be 20%. Councils must also provide evidence in their application that Council financial contributions are secured. That Council provides 20% contribution being $4 000 towards the Get Out, Get Active funding application to get women and girls being physically active within the Maranoa region. Get Out, Get Active was developed as a recommendation from Start Playing, Stay playing: A plan to increase and enhance sport and active recreation opportunities for women and girls – to partner more proactively with local governments as a key provider of active recreation opportunities. The objectives are to support Council to provide enjoyable, accessible and affordable activities, encourage innovation and partnerships, meet the needs of inactive women and encourage a culture of life-long participation. This offers a chance for women and girls regardless of their ability, lifestyle constraints or location to participate. The initiative seeks to provide additional sport and active recreation opportunities for all ages, from school leavers to seniors, so they can enjoy the benefits that come with being physically active. The program planned for the Maranoa region after detailed consultation with many stakeholders (see listed below) is to follow a 6 week program of a mix of Yoga/Pilates, general exercise, boxercise, culminating with nutritional tips and a ladies beginner golfing session. The program will be run for 6 weeks in Roma, Injune, Mitchell, Surat, Yuleba and Wallumbilla and for 3 weeks to include the districts of Mungallala, Noonga, Eumamurrin and Teelba. By offering to the smaller hamlets, it shows Council are not disregarding them and may then tempt them to travel to a larger centre for the remainder of the program or to keep the program going locally by organising further classes themselves. The theme of the program is “Get Fit to Get Active Again”. The target ages are young mothers with babies, stay at home mums and seniors over 50 years. The finer details of the program need to be honed when the funding is secured, e.g. 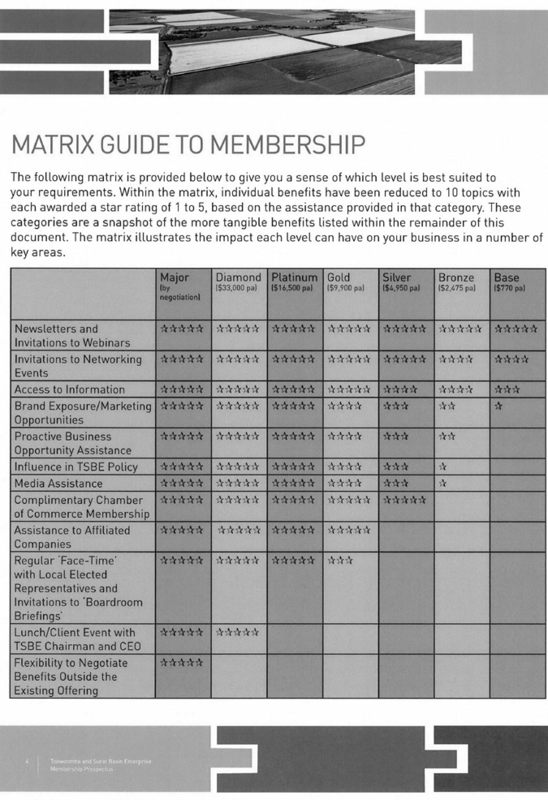 time/date of program delivery, classes most likely to succeed within a town/area, partners or stakeholders who can readily assist. Local providers will be used to keep costs associated with travel time and kilometric rates to a minimum, which would become astronomical due to distances to cover, thus allowing more value for money for the participants and add more weeks to the program. The use of local providers, who have all expressed enthusiasm and commitment, should then ensure a greater deal of sustainability to the project when the funding has expired, through classes continuing in the outlying areas with the trainers/providers/local “champion”. $4000, toward total project cost of $20,00 of which $16000 will be accessed from Department of National Parks, Recreation, Sport and Racing.